In which a recruit’s name is plugged into Google and the bits of information that trickle out–guru ratings, newspaper profiles, YouTube highlights, all that stuff–are synthesized in the hopes of getting a clearer picture of the player we’ll see at Auburn next fall. Previously: Jessel Curry, Craig Sanders, Roszell Gayden, Brandon Mosley, Demetruce McNeal, Jake Holland, Shaun Kitchens, and Cody Parkey. Sorry, but this might be the least informative edition of “Google surveys the recruits” I’ve ever written. Not because there’s a lack of information out there regarding Newton–quite the opposite, as you might imagine–but because we’re all already aware of most of that information. 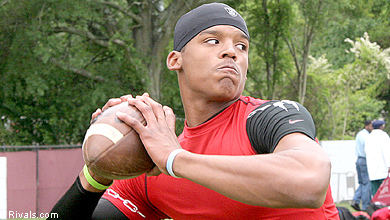 Newton has been the most studied, most visible, most hotly-anticipated recruit of the 2010 class since the day he committed. Informed Auburn fans already know the details of his awkward sojourn from Florida to Blinn Community College to the Plains by heart. He’s already put an entire spring camp’s worth of work in and has emerged as both the overwhelming favorite in Auburn’s quarterback derby and a respected member of the Tiger locker room. In short: we already know Cameron Newton. But before he gets his big Auburn debut at A-Day tomorrow, it seems like a good time to review what we know and find out if there’s anything we don’t. 2008 (FLORIDA): Redshirted … Action in season opener versus Hawaii, rushing for 10 yards and a TD on five carries, while connecting on 1-of-2 passes for 14 yards. 2007 (FLORIDA): Saw extensive playing time in five games during versus Western Kentucky, Troy, Tennessee, Vanderbilt and Florida Atlantic … Rushed for 103 yards on just 16 carries, scoring three touchdowns on the ground … Completed five passes in 10 attempts for 40 yards … Just sixth quarterback in Florida history to see action in the season opener as a true freshman, joining Tim Tebow, Chris Leak, Josh Portis, Cris Collinsworth and Doug Johnson … Career-long 24-yard touchdown run in the fourth quarter versus Florida Atlantic … Rushed for a career-high 46 yards against the Owls on just six attempts … Carried the ball five times for 33 yards against Vanderbilt … Guided the Florida offense to a touchdown against Tennessee, highlighted by an 11-yard run when he bowled over Volunteers’ safety Dennis Rogan … Scored first career touchdown on a 4-yard plunge against Western Kentucky … Completed three of four passes for 25 yards in his debut against the Hilltoppers … Enrolled at Florida in January 2007. HIGH SCHOOL: Participated in the inaugural All-American Offense-Defense All-American Bowl for Team East following his senior season … His squad won the game, 28-14 … One of nine quarterbacks in the Atlanta Journal-Constitution’s Super Southern 100 … As a junior, completed 62.4 percent of his passes for 2,500 yards and 23 touchdowns … Threw just nine interceptions and rushed for 638 yards and nine TDs. We’ve all had our eyes popped at these numbers before–the Tecmo Super Bowl stats at Blinn, the piles of rushing yards at every level, the Six-Foot-Freaking-Six listed height–but they still jump off the page. One you might not have noticed: that 62.4 completion percentage as a high school junior playing at the highest level of Georgia prep football. If Newton’s not the most accurate QB out there just yet, it’s not because he doesn’t have the potential. RECRUITNIK HOO-HA: Like all JUCO prospects (or at least the ones that weren’t totally under the radar coming out of high school), Newton has two sets of guru ratings: one coming out of Westlake, and the second coming after his time at Blinn. Both, however, were as premium-grade as you’d expect. Newton is a monster of an athlete and huge pocket passer with deceptive speed and quickness. He looks like an athletic receiving tight end. Essentially we would describe him as a pocket passer with the ability to get out of trouble and make some plays with his legs when he has to. He possesses ideal measurables — he has great size, is tall and well built and has long arms and big hands. Shows very deceptive arm strength. Release is high and over the top from the ear. He shows good touch on underneath throws and the ability to change velocities and crank it up. Shows good zip on the deep out route and gets adequate RPMs on his downfield throws. Can drive the ball downfield and shows good touch on the deep ball. He throws catchable passes and has a feel for leading his receivers. Extremely accurate in the short-to-intermediate range. He’s an excellent athlete. Basketball player with power and strength. Has adequate feet. Shows good pocket presence and buys a lot of second-chance opportunities with his athleticism. He is a threat to take off and run. Will steamroll smaller defenders that try and tackle him. Has above-average speed and some elusiveness to make defenders miss in space. However, his release can be long and he will wind up at times and then just push the ball at others. Not sure if he can consistently beat the rush with his delivery. He is actually more elusive in space than he is in the pocket, and if cornered, he is so big that he may not be able to avoid quick enough. He reminds us an awful lot of LSU QB JaMarcus Russell, only Newton is a better runner. But that opinion is in the vast minority of the many, many guru opinions offered about Newton the last several years. Overall, he came to Auburn with as much recruitnik approval as any player the Tigers have signed since the recruitniks started bothering to approve. LINKS OF POTENTIAL INTEREST: In the interest of brevity, I’m going to limit this to 10 items, because the number of Cameron Newton links out there is many, many many times larger than 10. No, I don’t believe arm strength is going to be a problem for Mr. Newton. an explosive quarterback that can beat you with his legs and arm. Cam Newton is ultra fast in the pocket and cannot be taken down by a single defender. You know it’s true, because you read it on Wikipedia. 4. Cameron has an older brother, Cecil, who made the Jacksonville Jaguars’ practice squad last year as an undrafted free agent center. What’s fascinating about Cecil’s story is that he didn’t even manage a scholarship offer coming out of Westlake–he had to walk-on at Tennessee State. Going from “D-IAA walk-on” to drawing an NFL paycheck is a hell of a climb, and the AJC (quite understandably) couldn’t resist contrasting that climb with his younger brother’s fall from grace at Florida. Wish the story was a bit longer and had a bit more panache, but it’s well worth reading nonetheless. There’s even a photo gallery to go along with it. “I don’t know if I have seen anyone with as much competitive spirit as he has,” Franchione said. “I have enjoyed watching him mature over the year. 6. Despite Newton’s struggles it was a hell of game–Blinn won on a punt return for TD with all of 30-some-odd seconds left in the game. More photos and stories here. The rest of the Big 12 had frankly be glad Chizik and Co. swooped in; the Sooners’ system is probably the closest thing in the country to Malzahn’s, and with the defenses in that league? No telling what kind of havoc he’d have wreaked. 9. Speaking of TWER, you can chart Newton’s arrival at this here blog from “oh, hey, they’re probably going after the ex-Gator kid” to “whoa, the interest is both intense and mutual” to “sweet, he’s all but committed” to “CELEBRATE GOOD TIMES COME ON.” Fun. “It was humbling. Take this: You got reporters asking you questions. At junior college, you could have the perfect day, you could go 20-for-20 for 500 yards passing and won’t nobody know. Honestly, you don’t have Gatorade in practice. You don’t even have a ball boy half the time. I come from Florida, which is probably at the pinnacle of college football — One day you’re on top of the world and the next day the world could be on top of you, so to speak. Brenham, Texas, is in the middle of Houston and Austin, which is the middle of nothing. I’m from Atlanta, so I was waking up to buses and airplanes, I go to Florida and I’m waking up to the bus transit that comes around and then I come to Brenham and I’m waking up to cows. Newton’s shoulders might be broad enough for the NFL, but it doesn’t mean there’s not an awfully sharp head on them, certain (ahem) indiscretions excepted. WHAT CONCLUSIONS WE CAN DRAW, IF ANY: For most recruits, it’s worth paying attention to any off-field tidbits we can glean (GPAs, character references, family adversity overcome, etc.) but by-and-large those only matter so much as they affect the recruit’s on-field potential. Not so with Newton. Because try as we Auburn fans might to snap our fingers and ignore his past, we can’t. His potential off-field impact has to be evaluated nearly as intensely as his on-field performance. Because even if on the Plains Newton’s the triumphant quarterbacking savior who made One Costly Mistake Of Youth, everywhere else he’s just the kid who stole a laptop and got himself booted out of Florida. If he slips up again at Auburn, the media firestorm of hindsight and tut-tutting will be very intense indeed. And more importantly, this Auburn staff’s reputation as judges of character will be totally, entirely shot. Fortunately, in making this off-field evaluation, I don’t see any evidence at all the laptop incident won’t be a one-off mistake. A damn serious one-off mistake, yes, and even I’m not sure his explanation of the arrest (or his insistence that he left Gainesville entirely voluntarily) should be taken at 100 percent face value. But if on one side of the ledger we have the arrest, on the other we have Newton’s otherwise spotless discipline record***; his quality grades; his interviews in which he comes across as a bright, well-spoken kid who’s taken responsibilities for his actions; his father the minister and his brother the hardworking, dramatically overachieving football professional; the good-to-great impression he’s left on his new teammates; and most substantially of all, the vouching for his character from Chizik and Co. On the balance, I don’t think there’s any question Newton deserves the benefit of the doubt … and is plenty likely to justify that faith, at least where keeping his nose clean is concerned****. As for his on-field performance, I’ll keep it short and sweet: look at what Gus Malzahn has accomplished already with quarterbacks with a tenth of Newton’s talent. It’s only fair to expect Newton to accomplish just as much if not more. Barring injury (or God forbid, off-field issues), he will be Auburn’s starting quarterback in 2010. And the expectation here is that he will be very, very good. *Not Safe For Brain. Unless you enjoy the inevitable mental dry heaves upon hearing Verne and Gary wetting themselves when they realize Tebow’s into it on the sidelines. **Check out No. 9 on that list: none other than Mike McNeil. Auburn had four other commits in that ESPNU150: Tim Lamb (! ), Lee Ziemba, Ryan Pugh, and Chaz Ramsey. 3.5/5 (with a half-nod for McNeil, who’s been good but not THAT good just yet) ain’t bad, I guess. ***As far I can find, anyway. ****I will admit that if you want to play devil’s advocate here, Newton’s offer sheets–coming out of both Westlake and Blinn–weren’t commensurate with his guru approval. According to Rivals, Florida and Georgia were his only SEC offers out of high school, aside from the two Mississippi schools; you’ll recall that Tubby took a look and passed. Last spring, the only BCS schools pursuing Newton aside from Auburn, MSU, and Oklahoma were Arizona, North Carolina, and Tyrik Rollison’s old friends at Kansas St. The latter is of course easily explained away by the laptop snafu and general unpopularity of JUCO signal-callers, and the former seems very likely a function of something–maybe the Gators jumping on him early?–other than a mysterious character issue. I mean, Mark Richt offered. But it doesn’t mean it’s not worth making a note of, at least. What is everyone expecting tomorrow out of Newton at A-Day? I for one would like to see a long bomb thrown down the middle- that has some zip on it, and doesn’t resemble a punt. Outside of that, I’d also like to see touch on short passes, and zip on out route throws to the sideline. But I’m not hard to please or anything. 1. The touch on the short passes. Auburn has too many playmakers (especially now that you can probably add Emory Blake to the list) to waste yards throwing easy swings and screens behind/over his receivers. 2. Decision-making. Sometimes college QBs with cannons for arms try to squeeze balls into places they shouldn’t. Remember that duck Kodi threw last spring game that would have been picked off by any competent secondary? None of those, please. 3. The zone read. Malzahn almost never ran it with Todd, but it’s such a devastating play when run correctly that even Caudle managed that 50-yard TD with it last year. If Newton has a handle on it, good heavens. I just watched all eight minutes of that high school highlight tape, but I honestly didn’t catch any of it. I was too mesmorized by how sharp those uniforms look. Especially the all-blues. Well, I did notice the fifteen yard quarterback sneak at 5:30. Hard to miss that. But I can not believe that Bitter didn’t type up that interview quote in its entirety. It’s missing the best part of that whole answer. The question is at 6:00 — watch until the end. Just wanted to point out something about the Wikipedia page. I’m pretty sure that Bama fans adapted that in quoted portion from this website: http://www.kodiburns.org/. Some Bama posters use the hyperbolic bio from that site often when talking about Auburn players (the language is kinda funny). I think the joke under the surface is roughly that you guys were just as excited about Burns three years ago as you are about Newton now. Of course, it proves nothing about Newton himself, but that’s what’s happening there on Wikipedia. I don’t want to sound like a jerk, especially since I’m a Bama fan venturing across enemy lines to read your breakdowns. I enjoy your blog and like hearing informed Auburners talk about their team. Just thought you might want to know that what you posted from Wikipedia was more than a bit tongue in cheek.